Celebrate your favorite couple's seaside nuptials with this custom artwork. 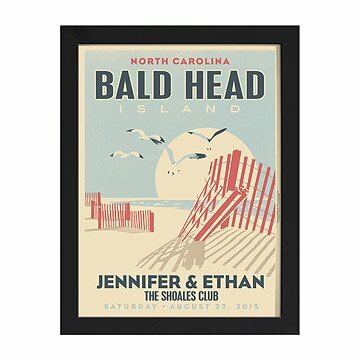 For a couple who commemorated their love on an idyllic shore, this personalized artwork captures the beauty of the shoreline of any beachy spot along the Eastern seaboard. Chicago-based artist Alexander Doll sets scenes of wedded bliss in the context of classic print announcements that are as stunningly unique as they are timeless. Perfect for a couple who said their vows on a favorite beach, this nostalgic print hearkens back to the nuptial announcements of yesteryear with its sharp, sans serif typography, and hand-sketched illustration of the peaceful scenery. Doll incorporates personal details, such as the venue, city, date, and the couple's names. A sophisticated way to fete an unforgettable occasion, this inspired gift captures the couple's version of their fairytale while giving them a stylish and whimsical work of art to remember the thrill of the day with every passing glance. Printed on archival paper using archival pigment ink in Ohio. Awesome and personal wedding gift! Loved receiving another scene (the mountains) for my wedding, that I went and purchased this beach scene for my friend as a wedding gift! With the personalization of the names, date, location, etc. it helps make the scene feel as if it was hand picked even though it's a stock scene. Absolutely recommend! I wasn't sure how my hubby would feel about getting this as a gift for Christmas from me (his wife) BUT...he LOVED it !! And so do I !! It's very well made and a great addition to our home bar area. I ordered the smaller size and it well exceeded my expectations. Perfect size and color for the space I was looking for.